I have to admit when Emile Henry asked if I wanted to try this new covered loaf pan, I was a bit skeptical about the claims they were making. It’s a gorgeous loaf pan, but would it really bake a bread with a perfectly crisp, shiny crust on the top and bottom, just because of the holes in the lid and on the bottom of the ceramic baking vessel? Well, I’m here to say I was wrong to judge without trying, again. 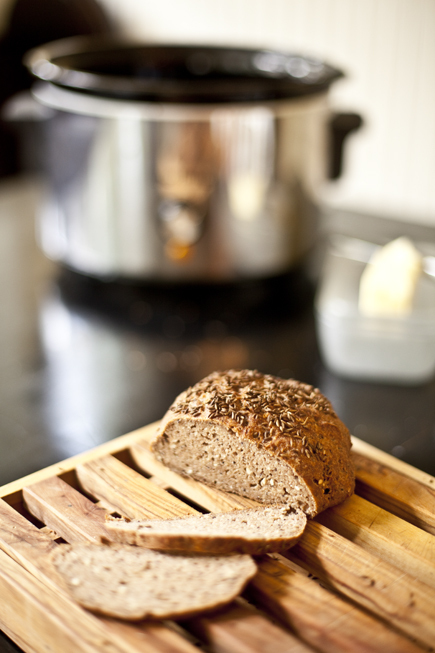 Just as I was wrong about the crock pot baking great bread, this loaf pan really does bake a fantastic loaf. 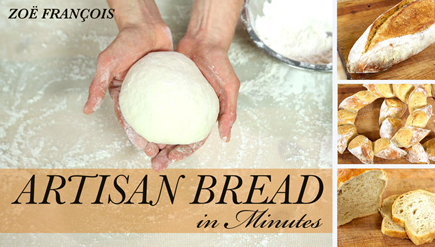 The crust is thin and golden brown, without having to add steam or remove the cover during baking. It’s all about the holes! You can see the same loaf baked in a regular loaf pan at the bottom of the post and see for yourself just how well it works. 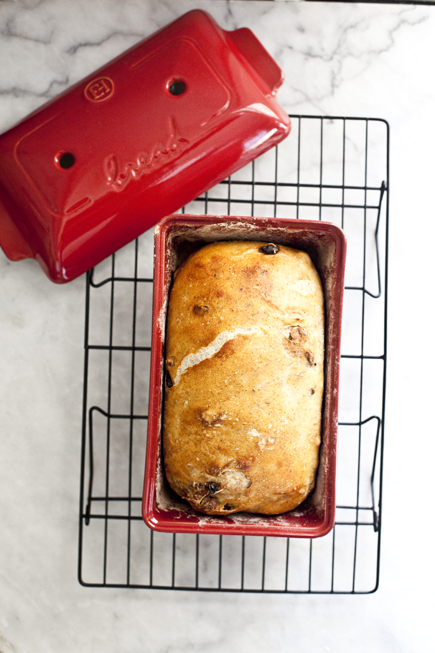 I used Red Star Platinum yeast to mix up this raisin walnut bread dough, and I loved the results with this loaf. Christmas Stollen is a wonderful German baking tradition this time of year. 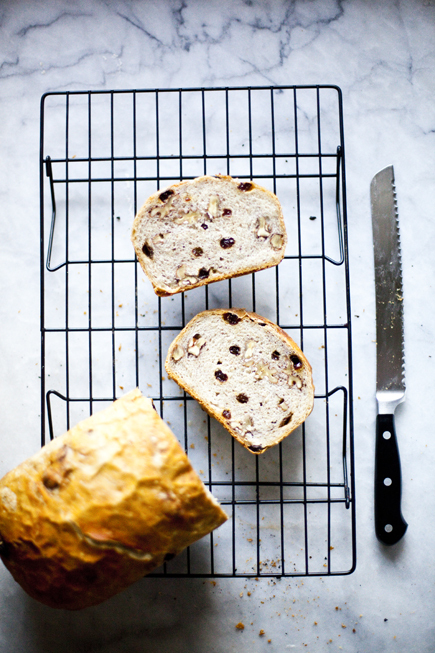 A sweet loaf that is studded with dried fruit, spiced with cardamom and a special treat of almond paste runs through it. Once it comes out of the oven it is traditional to slather the warm loaf in butter then roll it in sugar, but we skip the extra butter and dust it with a thick layer of confectioners’ sugar to look like the snow outside. 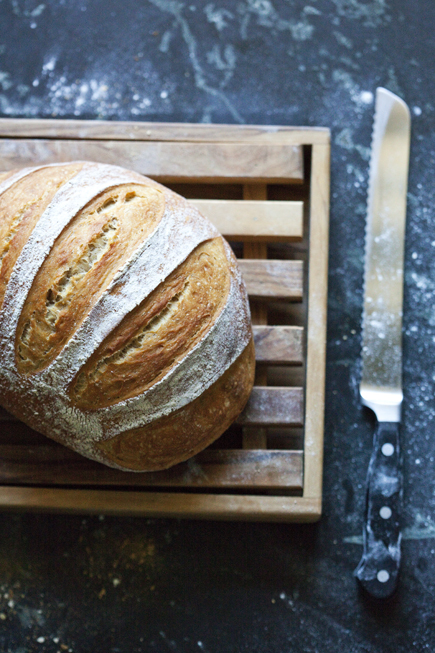 This loaf actually holds up very well for a couple of days and that makes it a great gift for the holidays. This is a Super Peel. It is one of those products, like the Danish Dough Whisk, that changes the game for baking with our dough. I was skeptical that this cloth-covered peel would do the trick of transferring our wet dough onto the hot stone in the oven without sticking. I’ve come to use parchment to guarantee the dough won’t stick to the peel, but that’s not at all necessary with the Super Peel. Even after an 1 1/2 hour resting time the dough slid right off the cloth, no sticking, no prying it off with a dough scraper. Voila! 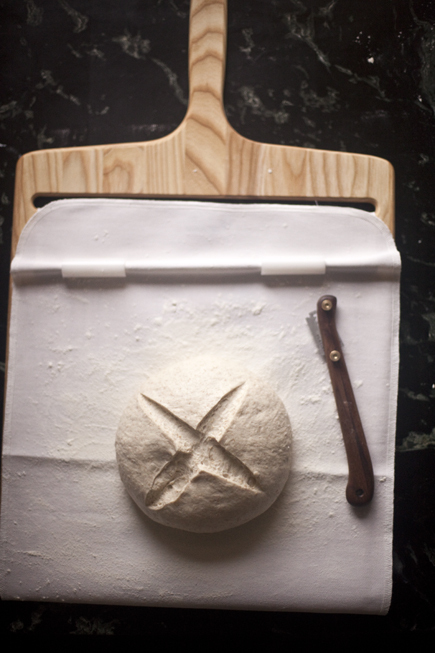 The most exciting part is that it scoops the loaf off the hot stone with as much ease. No more chasing the loaf to the back of the oven while trying to get it back on the peel. A thermometer: you really can’t get a good crust until you know your oven’s temp. They’re cheap and effective.